The Purposeful Pappy is thrilled to announce that I am partnering with Oral-B and Life of Dad for their #PowerofDad Father’s Day Campaign. Lots of exciting things are going to be happening here. I am MOST excited about my Pappy of the Day series that will be appearing every day between now and Father’s Day. Each day I will feature a great Dad who was nominated by someone in his life that has noticed how amazing he is! Our first Pappy of the Day is Zac Coburn. Zac is such an amazing father that it’s going to be hard for me to even put it into words. Not only does he work full time, but he goes to school part time, all so that he can provide more for the family. Even as busy as he is (and I’m sure tired too), he still has all the energy in the world to run around with the kids when I go to work. He is the most genuine, caring, selfless guy there is out there, and he deserves all the credit in the world. Keep Fathering Zac! 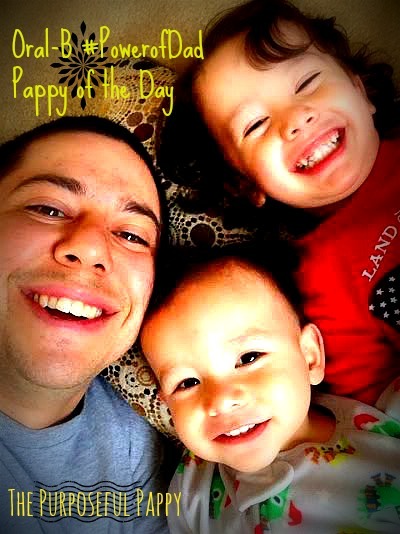 Congrats on being Pappy of the Day and showing everyone the true #PowerofDad!! I’m so proud of my son, Zac Coburn! He is a perfect Dad for this recognition. He is truly dedicated to his family and they mean everything to him! Congrats, Z!